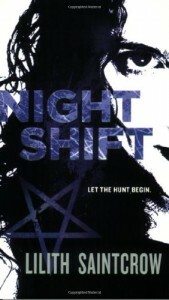 Night Shift (Jill Kismet, #1) took me awhile to get into and to find my solidity into its dark world. After reading this I check the review to see what was up with me not loving this? It seems it is helpful to understand it better by reading her previous series. I may try her other series to see if I enjoy it a little better. Because after finish this book I’m not too excited to continue the Jill Kismet series at this time, but I do see the potential in her very interesting dark urban fantasy’s.